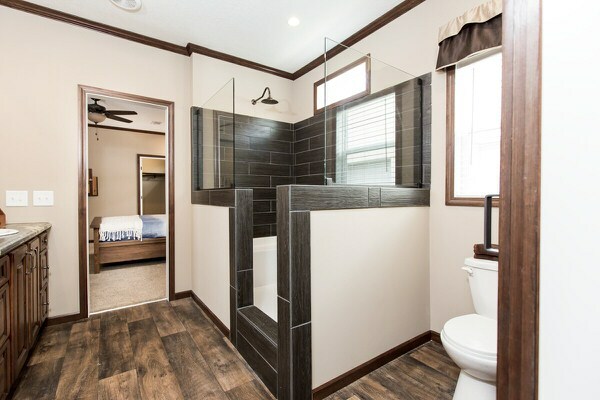 It’s fun to take a look at new home designs and see what the mobile home manufacturers have come up with. 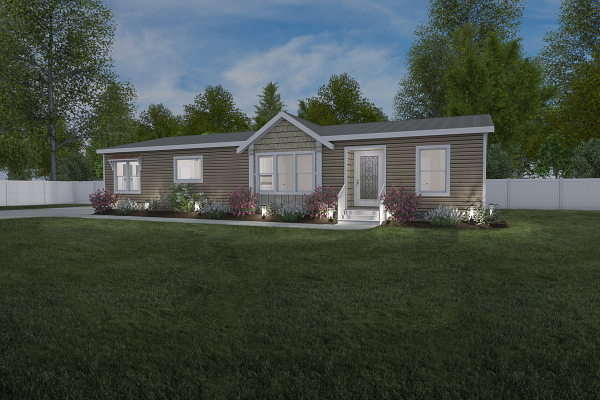 This week the latest in our manufactured home design series: The Abigail is in the spotlight. 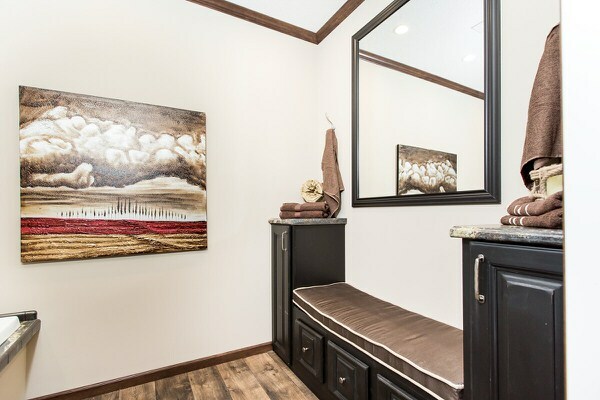 At 1730 square feet, this three bedroom/2 bath mobile home from Clayton Homes is a great representation of a mid-level design. 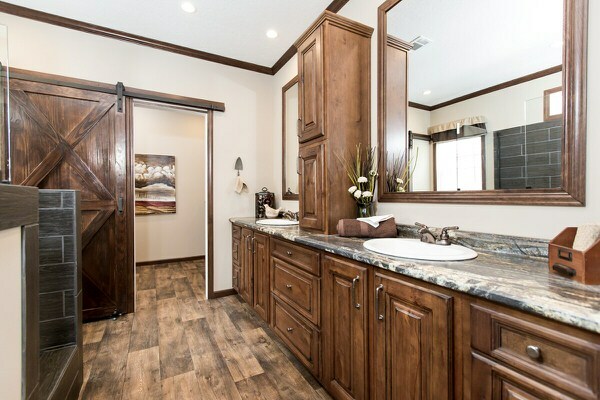 Related: Take a look at one of our recent new manufactured home designs that featured a twist not seen very often! 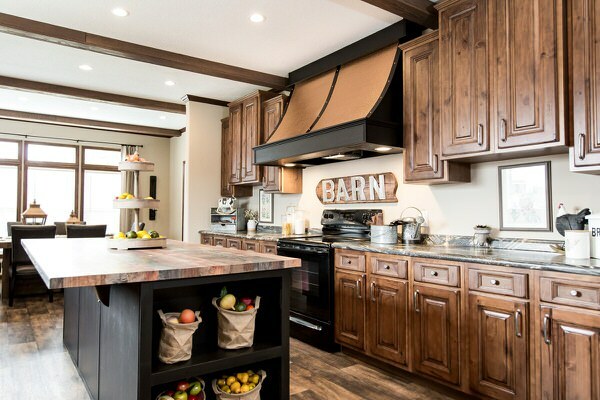 The first thing we noticed when we scrolled through the images of this mobile home is that it was such a nice combination of lighter colors and darker rustic wood. The pallet look over the fireplace mantle, the stonework around the fireplace itself, even the wood panels over the window treatments, all add to the rustic charm of the home’s decor. A nice combination of light and dark finish this room. 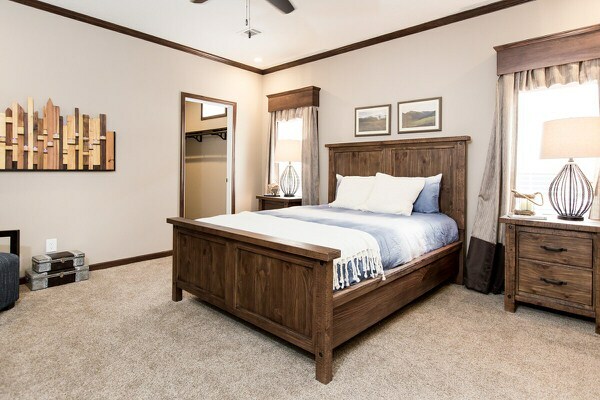 The master suite also includes decor to carry the rustic look through the home. 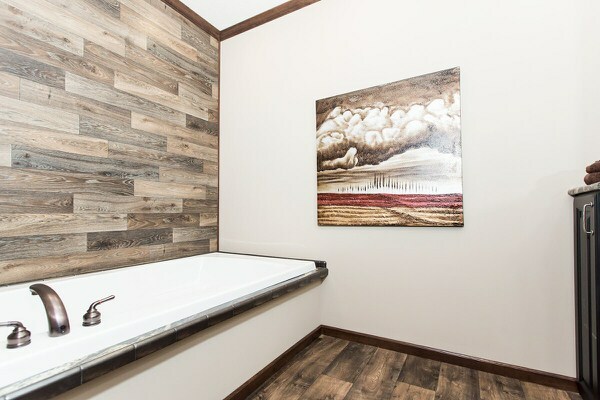 Wood panels over the windows, barn doors separating the tub area from the rest of the master bath, a pallet wood look on the bathroom wall all make for a gorgeous combination. There is also more cabinets than is typically found in a master bath, probably because there isn’t a linen closet in the space. Another interesting addition is the bench area next to the tub, which is typically found in a mud room. I don’t know about you, but I usually don’t have visitors that need a place to sit while I’m soaking in the tub (at least not since my kids have grown)! Wood panels over the window treatments cover a basic curtain rod. Look at all those cabinets! Gorgeous shower with plenty of space. Wood look wall treatment adds to the rustic look. This is an interesting addition to the master bath. If you are looking for plenty of room to work in your kitchen, than look no further. This kitchen offers tons of both cabinet and countertop space. 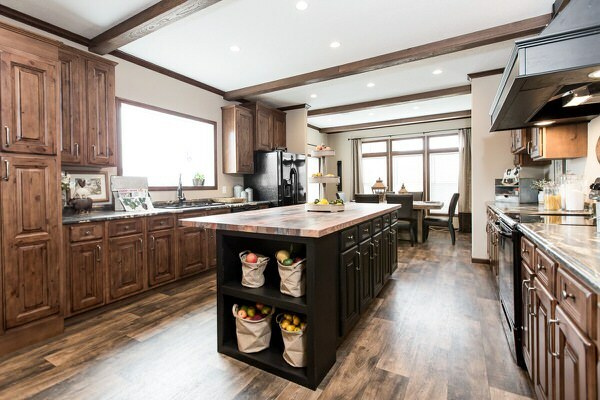 The rustic look also continues into the kitchen with the dark wood look laminate, wood ceiling beams, and cabinets with a knotty wood look to them. There are a couple of things I question in this kitchen though. First, the use of two types of countertops, I think I prefer the cutting board look that is on the island to the marble look on the rest of the kitchen. Also, there doesn’t seem to be a pantry. And I am a big fan of a pantry to store dry items that we take up so much space in the cabinets. The kitchen opens up into the dining room which leads into a small laundry room. There is just enough room for the washer/dryer and a laundry sink. 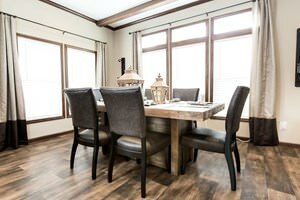 It’s much smaller than some of the homes we have featured in our manufactured home design series, but for a mid-level home its still reasonably good size. Lots of natural light in the dining room. Laundry room with side entrance to home. The floor plan for this mobile home is pretty basic. An open floor plan that allows the living room, kitchen and dining room to flow into one another with two of the bedrooms on one end of the house sharing a bathroom and the master bedroom on the end. Some options can be added or left out depending on your preference, most notably, the fireplace and the laundry sink in the laundry room. I would probably leave the laundry sink out and add a closet there for coats and shoes, simply because there isn’t a coat closet anywhere. 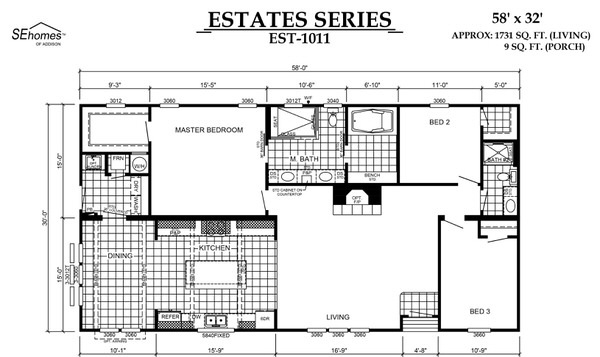 A look at the floor plan including the options. The exterior of this home is pretty basic as well. 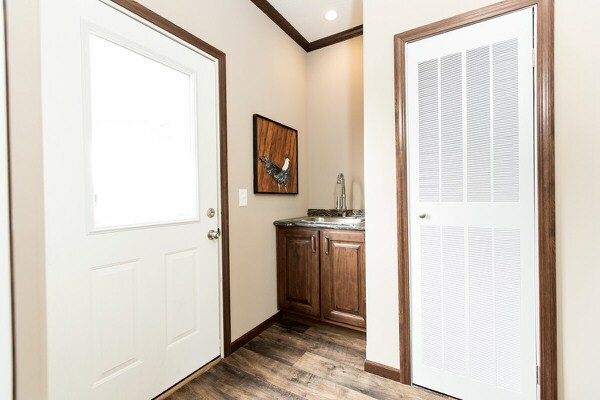 You won’t find a huge porch or any of the extras that we have shared on some of the other homes in our manufactured home design series. However, a porch wouldn’t be hard to add to the front or side entrance of the home, depending on your preference. Related: 45 Great Manufactured Home Porch Designs. Landscaping makes the exterior of this home shine! I didn’t find a price for this particular mobile home. However, I would guess that it would be priced much lower than some of the homes we have featured in the past, simply because it is a little more modest in design. I really like the way it is set-up, and think it would make an excellent starter home! What did you think of this installment in the manufactured home design series? We want to hear from you, comment below and share your thoughts! Thanks for reading Mobile Home Living! When will you be featuring buying manufactured home in Arkansas? Will be doing so soon! I can! I’ll get it on top of the list for you! The bench in the master bath is a great idea – something that we designed into ours for when we remodel this spring. The garden tub is out, so is the phone booth shower stall. An epic walk in shower will take their place and under the window where the tub once was, will be such a bench. I dress in the bath suite – closer to the closet, and I don’t wake my hubby since I leave the house much earlier than his alarm. As I get older, a place to sit while putting on my shoes is more and more useful. I now put on my shoes at the top of the stairs. When we move to the country house full time, I’ll be without stairs and using my bench! It’s a fantastic age-in-place, and accessibility feature. After completing my tour of duty last year caring for an elderly parent I can say that there was more than one occassion I wished I had somewhere to sit while helping mom with her shower. Early on, she still wanted to do things for herself, yet, needed someone near to assist. It was weird standing there at the sink trying to be near enough to help but still give her space and dignity. I’d have loved a bench to sit on and read my kindle until I was needed. Our remodel will take all those things into account, and the walk-in will be easily modified later to be a roll-in shower, if required. 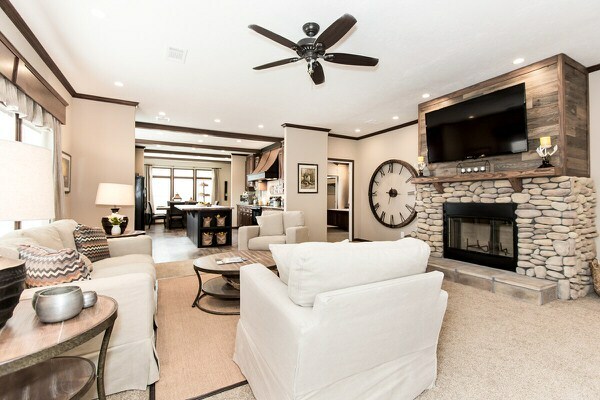 This homebuilder seems to have considered mobility in several areas, and that’s super cool. Thanks for the article. The house with a combination of classic and modern, great design!